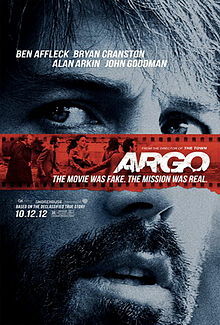 Argo, the film based on a CIA (and Canadian!) led action to free Americans from Iran during the hostage crisis, opens with a clever conceit. Now, naturally, the film’s marketing is geared towards touting the heroic work of agent Tony Mendez (played in hirsute and convincing fashion by Ben Affleck) as he wiles his way into Tehran to rescue six trapped Americans. However, before getting there, the film, which was also directed by Affleck, strives to contextualize first the facts of history and then the emotion of the situation the seized Americans find themselves in. This movie stars Ben Affleck. In striking complementary opening sequences, the film swiftly establishes, using a prologue of animated storyboards to highlight the near-surreal circumstances, the brutal back and forth of Iranian politics and the Islamic revolution; a narrative with twists and turns more terrifying than any Hollywood plot. It would play as almost unbelievable, until the film crash cuts to its live action recreation of Tehran at ground level; with people protesting in the streets, noise and unrest growing, and the walls of the US Embassy suddenly feeling very flimsy. A riot breaks out, hostages are taken, and the tension begins to build. Despite all the hoary Daredevil and Gigli jokes you may have, with Argo Affleck confirms that his career as a director is no illusion. He’s now crafted a third solid bit of film making (along with Gone Baby Gone and The Town) that, to his credit, has moved him further from his comfort zone. In the film, Affleck trades the comforting streets of hometown Boston for a lively mix of sleazy 70s era Hollywood and the gritty disorder of revolutionary Tehran. The film rather effortlessly builds these two diametrically opposed worlds while also finding time to slide in the usual cadre of CIA hallways, boardrooms and offices necessary to get the plot moving. And boy, does it move. Make no mistake, the real star of the film is its absolutely unrelenting pace. Due to the aforementioned opening sequence and constant in-film TV chatter, the audience can never quite shake loose of the anxiety of the Americans in hiding. As fun as Argo is when its joking around with John Goodman and Alan Arkin (playing Hollywood lifers or, basically, themselves) there is always that constant hum of pure electric suspense. Adding to that are the seemingly endless supply of quality character actors, from Victor Garber to Kyle Chandler (and even a Bob Gunton cameo), that ably fill out the cast. As per usual, Bryan Cranston leads the charge with a thankless role that calls for the appropriate blend of blustery confidence and humourous asides. In effect, the film is stocked with actors that make scenes of men talking on phones exciting. Goodman and Arkin. Just a couple of the fun casting choices in Argo. Despite its sleek design and speed, Argo does have a few loose parts. The subplot involving the separation of Affleck’s Mendez from his son, which, yes of course, is an attempt to humanize him, also feels a bit rote. For a film based on such an audacious premise, during such an intense period of recent history, it seems a bit pat to frame Mendez’s character arc around such a well-worn (though admittedly effective) narrative ploy. Unfortunately, this also feeds into Affleck’s resolute desire, as seen in The Town, to film himself in near constant flattery, staring deep into the middle distance. 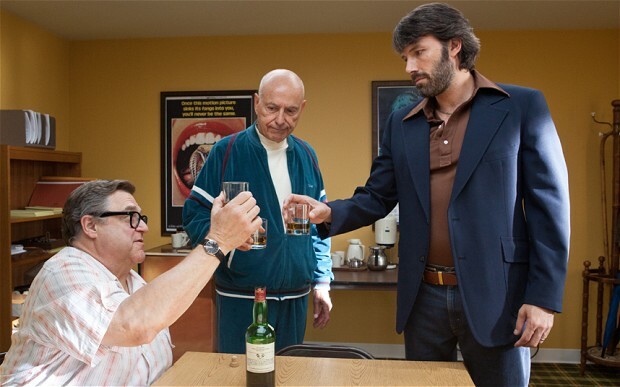 And on a different note, while the film does acknowledge, even in the glow of the mission’s success, the plight of the average citizen just trying to survive in a country torn asunder, Argo’s Iranians appear to exist largely in an endless state of raging agitation without consequence. Then, of course, there is the story that most Canadians now know involving our country’s ambassador Ken Taylor and the role the Canadian government had in the entire affair. Could as exciting and intense a film have been made by telling Taylor’s story of the events? Is it fair to give Mendez and the CIA seemingly all of the credit (despite a re-working of the film’s postscript)? Maybe it is better to have a film like Argo instead with its colourful storyboarding of history; a film that revels in its suspense, its cinematic essence, and its understanding, despite proclamations to the contrary, that if you’re going to tell a fake story, you may as well make it a real hit.